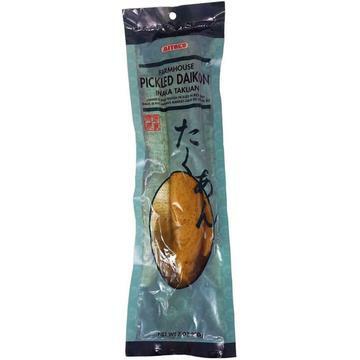 Natural Import Company - Traditional Japanese foods - Mitoku Takuan Pickles - 7 oz. Mitoku Takuan Pickles - 7 oz. Ingredients: daikon (Japanese white radish), rice bran and sea salt. "Daikon," or Japanese giant white radish is hard in texture and withstands pickling without becoming soft, making it an ideal crunchy pickle. Takuan (daikon radish pickled in rice bran) is one of the most popular of all Japanese pickles. Their crisp texture and sharp, tangy flavor make them a perfect accompaniment for meals of brown rice or Japanese noodles, vegetables or miso soup. Slice off a few thin pieces as a delicious condiment. Eat with tempura, fried vegetables, fish, tofu or as a colorful garnish.